Deputy Foreign Minister sends message of support to U.S. ambassador to Israel who was cursed by PA chairman. 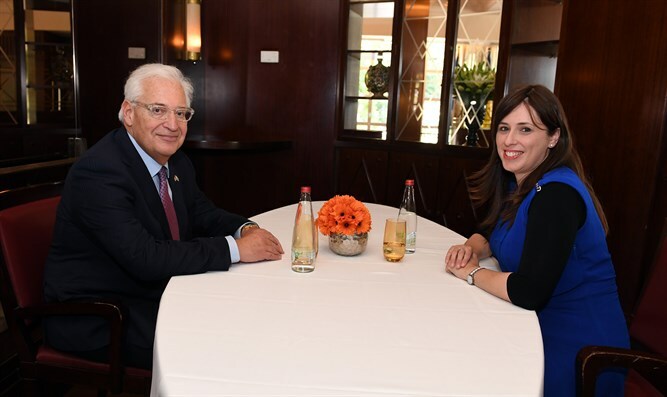 Deputy Foreign Minister Tzipi Hotovely (Likud) on Tuesday published a message of support and encouragement for the U.S. Ambassador to Israel, entitled "David Friedman, we stand behind you." The message came a day after Palestinian Authority (PA) chairman Mahmoud Abbas insulted Friedman and called him the “son of a dog”. "Israel appreciates your dedication to the battle for truth and the war against terrorism," Hotovely wrote to Friedman. "You represent an administration that recognizes historical truth and leads historic moves. An administration that rightly demands that the Palestinians take responsibility, be active in the fight against terrorism, and condemn brutal Palestinian terrorism that cut the lives of three Israelis this week," she continued. "The curses that Abu Mazen said yesterday, and the embarrassing name calling, only insult the Palestinian people. A leadership that does not condemn terror against innocents and is busy spreading accusations cannot receive international backing," Hotovely said. "We are proud of your courage, Ambassador Friedman, to tell the truth, and to stop seeing the Palestinians as a victim who is not responsible for his actions," she concluded. Abbas, who spoke in Ramallah on Monday, said, "The United States legitimizes settlements. That's what American officials do, and at their head, in Tel Aviv, is David Friedman. He said, 'They're building on their own land.' The son of a dog, they're building on their own land? He himself is a settler, and his entire family are settlers." Jason Greenblatt, U.S. President Donald Trump’s Special Representative for International Negotiations, later denounced Abbas.